We’re pretty excited about this one! Looking for power and all of the most advanced features, but sick of the same old, square-shaped box mods? 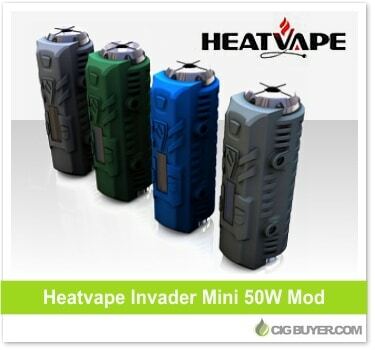 The Heatvape Invader Mini is a rugged new regulated device offering up to 50W of power and wrapped in a protective silicone shell. Not only does it provide a comfortable grip, but it’s shock resistant and waterproof. It’s VV and VW with a small OLED screen and even has automatic temperature control; sensing which type of coil is attached and firing down to 0.10 ohms. Really a great rugged mod, excellent performance, tuff too.